Centrally located Doubletree Hotel Boston is one of the most popular affordably priced hotels in downtown Boston for business travelers during the week. 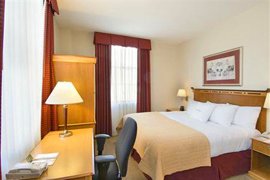 If you're looking for nice but inexpensive Boston hotels convenient to business, entertainment, and tourism attractions, you may find a hidden treasure here. On the weekends, the Doubletree Hotel's downtown Boston location attracts leisure travelers who want to be close to the Theatre District, Chinatown, and other top entertainment venues - and who sometimes find very attractive. An especially nice feature if you're travelling with children is that a playground is located right behind the Doubletree - not normally what you'd expect to find in a downtown hotel! The South End and Bay Village are also just a 5-10 minute walk away. A subway stop adjacent to the hotel gives you fast and easy access to other parts of the city. What does Boston's Doubletree Hotel offer? The Doubletree Hotel Boston, occupying a building that once served as a high school, now features feng shui design elements to connect it to adjacent Chinatown. The hotel's comfortable 267 rooms and suites feature some of the same high-end amenities that you'll find in Boston luxury hotels - down comforters, plush pillows, and high speed wireless internet connectivity. What other amenities will you find at the Doubletree Hotel Boston? A very nice "plus" is that you'll have complimentary access to the top-notch athletic facilities in the YMCA next door, including weight and aerobics rooms plus a huge Olympic-size swimming pool. If the small kiddie-sized pools featured by many hotels drive you nuts (personally, I hate swimming from one side of a pool to the other in 4 strokes or less, not to speak of bumping my knees on the bottom), the size of the pool will be reason enough to make reservations. 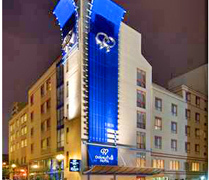 The Doubletree Boston has a convenient on-site restaurant, bar, and cafe. But considering the number of great restaurants, pubs, and casual eateries in the immediate and surrounding neighborhoods, including Chinatown, you'll probably want explore all the possibilities. What else is near the Doubletree Hotel Boston? Boston Common is only a 3-5 minute walk away. Go ice skating on Frog Pond in the winter, or walk over to the Public Garden for a Swan Boat ride during warm months. Continue across Boston Common to Beacon Hill to explore the antique shops along Charles Street, or walk across the Public Garden to enjoy the gorgeous Victorian mansions and great Newbury Street shopping in Back Bay. Have a tasty dinner in Chinatown, where you'll find some of the best Boston Cheap Eats, or walk along Boston's historic Freedom Trail through downtown, the North End, and even Charlestown. Or walk 10 minutes to the east and you'll be at the waterfront. And of course Boston's Theatre District is right at your doorstep. All of these attractions are part of what makes the Doubletree Hotel one of the most popular downtown Boston hotels. Like many visitors, you may find yourself coming back again and again.